Like the Christmas Oratorio, Bach’s four settings of the Kyrie and Gloria for the Lutheran liturgy are largely ‘parodied’ from existing works. Puritanical 19th-century scholars threw up their hands. But as a supremely practical musician, Bach saw a more durable home for music whose performance would necessarily be limited. For the noble Kyrie of the F major Mass he adapted a much earlier Kyrie setting. Elsewhere he parodied assorted cantata movements, carefully adapting them to the Mass texts. If the minor mode slightly mutes the jubilation of the G minor Mass’s ‘Gloria in excelsis Deo’ (how many other minor-mode Glorias can you think of? 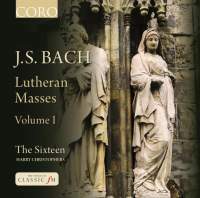 ), both Masses offer a fund of glorious music. Harry Christophers shrewdly pairs two of the Masses with Cantata No 102 – Lutheranism at its most self-laceratingly penitential – which Bach drew on for the Kyrie of the G minor Mass and the ‘Qui tollis’ and ‘Quoniam’ of the F major. As in his performances in London’s King’s Place, he uses two voices to a part in the choruses and shares the solos democratically. Occasionally the sopranos are overwhelmed in the contrapuntal melee. In the Kyrie of the F major Mass, the cantus firmus on oboes and horns could have rung out more. But the freshness, agility and precision of the performances, animated by Christophers’s buoyant direction, are a constant pleasure. The rollicking coloratura of the F major’s ‘Gloria in excelsis Deo’ can rarely have danced so infectiously. If the two countertenors and the mellow bass of Ben Davies are the pick of the soloists, all have clean, youthful voices and phrase thoughtfully. On a pair of Chandos discs, a quartet of singers accompanied by the Purcell Quartet adopt an even more minimalist approach to the Masses. If some of the solo singing there has more individuality, I prefer Christophers’s two-to-a-part solution and the greater range of expression he brings to the choruses.